• I live a couple of blocks from Kaze, the sushi and Japanese joint in Roscoe Village. • Kaze has been around about 4 years. • Until tonight, I averaged .25 visits to Kaze per annum. One of the problems with the multitude of toppings placed on the fish was that there were far too many for me to keep track of with photos alone. Banana peppers, garlic, enoki, tuna penuche (okay, I’m joking), I just couldn’t keep track of all the flavors being thrown at me. 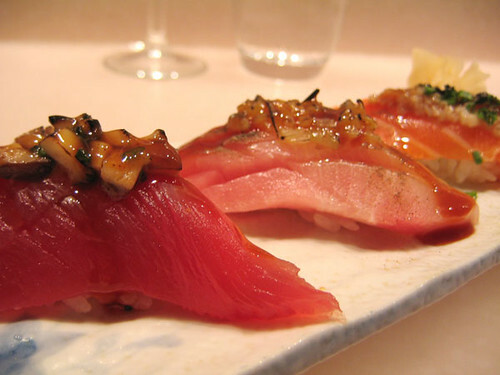 Here is, yes, tuna, with yellowtail which is a TUNA, and salmon, each topped with some damn thing, and slathered with the soy sauce and truffle oil, to the point of practically seeming like dessert sushi (how far were we, really, from tuna with whipped cream and a cherry on top?). Looking back on the meal at this point, where the most satisfactory dish had been the one with the strongest fish, I began to feel that the sauces were doing pretty good fish a disservice, making it seem bland by globbing it up and covering it up with too-strong alternative flavors instead of enhancing and sharpening it with something simple and clean. But tonight I was craving sushi, and my garage door had broken earlier in the day, making the logical thing a walk to the nearest sushi place, however deep my philosophical differences with it. So I decided to see if I would feel now the same way I felt then. I plopped myself at the bar— almost empty when I got there, full within a few minutes on this Friday night— and ordered a saketini (name aside, the least absurd of the absurd fusion drinks on offer) and listened to the specials. Two really appealed to me— a braised oxtail/coconut curry soup poured over some kind of Japanese custard, and some little river crabs deep-fried with some kind of dipping sauce (you eat them like soft-shell crabs). But I decided I couldn’t finish the whole order of the crabs myself, and stuck to the soup, as well as a plate of sashimi and sushi, chef’s choice. The soup— well, it was quite good. Would have been better if strands of oxtail meat didn’t seem to be as precious as saffron threads in it, but it was plenty spicy and appealingly coconutty. A very nice soup… although I couldn’t help but think that I had just paid $8 or $9, probably, for a cup of something that (mostly tasting of coconut milk and spicy heat) was functionally identical to the soup going for $2.95 a quart at the Thai place in the next block. My plate of sashimi/nigiri—virtually identical to what I had three years ago, I believe, everything I mentioned above (banana peppers, garlic, enoki, mushrooms, truffle oil) turned up on it. And like I thought three years ago… it was, basically, a disservice to the fish, which is of pretty high quality, not mindblowing, but certainly above bargain sushi lunch spots like Umaiya. By far the best part of the plate was among the simplest— there were some really nice slices of amberjack, fatty and very clean-flavored. Dipped in a light ponzu sauce, they were first-rate. But at least half of the gussied-up sushi pieces were, to me, botches, muddying fish flavor with something not only heavy-handed in itself but persistent enough (e.g., truffle oil) to hang over onto the next piece. Not good. After this, my preconceptions largely reaffirmed, I felt like ordering one cooked dish. My waiter suggested a flounder in a parsley-butter sauce; he was high on this, it sounded like boring banquet food to me, so I pushed him for another suggestion. Somehow that led to tuna tartare, the official dish of California in 1996, which I’d gotten stuck with three years ago after explicitly saying I didn’t want that kind of obvious thing. Hurriedly backtracking to the cooked kind of cooked dishes, I said oh fine, give me the flounder, without much enthusiasm. To his credit, he didn’t steer me wrong. It was small but terrific. Lightly, almost fluffily fried, floating in the middle of a vast green sea of parsley-butter sauce, it was a sunburst of happy fried and herbal flavor on the plate. Now, I have two cavils about the way it arrived— one, it seemed like a spoon might have been more appropriate for eating it and enjoying the sauce (and not the teeny-bowled parfait spoon that came with the soup earlier), and two, as if to mock the crack I made three years ago, there actually was whipped cream on top of it. I thought I must be crazy, it had to be creme fraiche or something, but no, it was honest to God sweet whipped cream. But easily shoved aside to melt at the far edge of the parsley sea, I ate the fish without it, and I loved it. Kaze seems to be popular as heck with my fellow Roscoevilleins, everyone else at the bar seemed to know the sushi chefs already, so there must be an audience for fusion sushi banana splits. But having given it two shots, I have to say I remain convinced that that’s a sure way to ruin good fish with a lot of flash and filigree it doesn’t need. So the thing Kaze is famous for, I would say beware to. Yet around the edges of all that there seems to be quite a good Japanese fusion restaurant turning out interesting dishes of high quality. So I may be back sooner than 2012, but if I do, it will be while ordering carefully to avoid the main attraction. I was a bit startled to learn from an LTHForum thread that Boka had opened in (late) 2004. I was thinking of it as one of the new restaurants; apparently it just slightly postdates Charcoal Oven. Nevertheless it is slightly newer than it looks thanks to the presence, and subsequent Food & Wine best new chefs anointment, of Giuseppe Tentori, who I guess has just been there a couple of years at most. If, as was claimed at the time, Boka was once trying to be the new Blackbird, that’s clearly not Tentori’s aim. He’s clearly aiming for a delicate sort of Asian fusion in which main ingredients are paired with surprising new flavors, many of them citrus fruits or of a similar lightness. So it’s more like the new Yoshi’s, or the new Le Lan— or whatever the hot restaurant of Asian fusion circa 1991 was, it felt more like dining a decade-plus ago than the last several upscale meals I’ve had. Not that I object to a little time travel with my meal, any day. The down side is that many of these novel flavor combinations just didn’t pan out; the meal was a frustrating mix of spot-on marvels and weird, who-thought-that-went-together moments. A starter of hamachi paired with a brightly grassy cilantro sauce and something called “young coconut-buddha hand vinaigrette” (I could look up what all that means, but really, it’s better as just pure poetry) was exquisitely light, a little shot of helium for the palate. Slices of duck breast in some combination that included a cornmeal sauce (however such a thing is possible) were savory and intensely satisfying. Sweet roasted beets with a tangy beet puree and little dicey bits of smoke flavor from Nueske’s bacon was a terrific salad. Dessert ended things on a high note; I really, really liked a crepe cake with cider sorbet, a perfect autumn dessert with great texture and flavors. The room is quite nice, romantically dark and cozy, sails that look like they came from Calatrava’s Milwaukee art museum make something dramatic out of a square box room. Service was pretty solid, a little young and overeager in its enthusiasm for chef’s cuisine, but capable and on top of things throughout (when my wife noted that her cocktail had been quite strong, the immediate response was to summon an extra round of bread service). All in all a good meal, but not one that made me feel like I was in the assured hands of a master; if I were to return it would be with more thought given to each thing before I ordered it, and whether I really believed that its four or five preciously described ingredients belonged together.